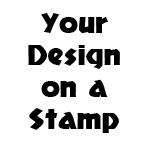 We are suppliers of Custom Made, Self-Inking, Pre-Inked Rubber Stamps, Inks & Accessories. Buy Rubber Stamps Online. £1.50 delivery charge for orders under £30. Free delivery over £30.